WORMS' Web Presence Has Moved! The fair had first brought pieces of the world to Claire, long before Michael, back when she had a mother and father. She’d found herself inside a tent just as humid and red as the tent of Nature’s Mistakes. Rather than a headless chicken, a woman whose bones had not grown beyond her first year of life was the Mystery Finale. The woman lay sprawled across a tiny rose-colored chaise lounge. Paralyzed from such small, weak bones, she takes in the world—never having sat or stood said the Talker. Her quilt of skin, powder white, bunched over and around her and flowed beyond her twisted, flipped feet. Some fingers poked out from underneath, stiff and pin straight. Her chin and torso seemed one. But what is meant by possible. Who are we to say what should be said the Talker. Despite her stunted bones, her head had continued on to a full size and in her head lived an adult brain full of many facts. Over the head sitting over the brain came hair curled in brittle ginger sprigs inching out from all directions. She did not look real but She is alive! She blinked her small eyes as the living do. Her doughy cheeks warped up as she smirked. She looked at Claire. She smirked as the living do. She was alive and Claire didn’t know how one could be and not grow. How said Claire. This was how it was meant to be. World travelled and more valuable than a jewel. Full of jewels of her own. More valuable than most anyone or anything. She learned and saw and took in the world without ever having to actually move! Said the Talker. Claire reached her hand toward the quilt of skin, she reached in and felt for the jewels. She felt the jewels and moved them toward the open. They hit the open light and bled into the doughy cheeks that warped up as the small woman smirked at Claire. A moment rushed beyond the humid, red tent, beyond the little rose-colored chaise lounge, and there was only that moment. Heather will be reading her work at WORMS on Tuesday, April 17. Are the colleges doing their job? Paper on the steady increase in the appreciation of Jesus, with footnotes. Alicia will be reading her work at WORMS on Tuesday, April 17.
eve of the first Coalition siege! Readings by Justin Sirois, Alphonso Lingis, and Ed Steck! 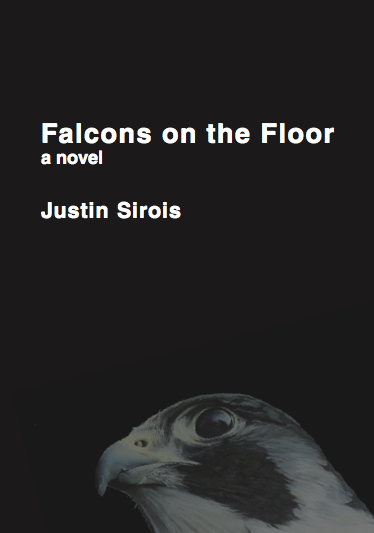 JUSTIN SIROIS is a writer living in Baltimore, Maryland. His books include Secondary Sound, MLKNG SCKLS, and Falcons on the Floor written with Iraqi refugee Haneen Alshujairy. He also runs the Understanding Campaign with Haneen and co-directs Narrow House. Justin received several individual Maryland State Art Council grants and a Baker "b" grant in 2010. ALPHONSO LINGIS is professor emeritus of philosophy at the Pennsylvania State University. Lingis has had wide success as a public lecturer due both to his captivating style of writing and also the performance art atmosphere of his lectures. During public talks he generally appears in costume or speaks amidst strange background music or recorded screams, often in total darkness. His books include Excesses: Eros and Culture (1984), Libido: The French Existential Theories (1985), Phenomenological Explanations (1986), Deathbound Subjectivity (1989), The Community of Those Who Have Nothing in Common (1994), Abuses (1994), Foreign Bodies (1994), Sensation: Intelligibility in Sensibility (1995), The Imperative (1998), Dangerous Emotions (1999), Trust (2003), Body Modifications: Evolutions and Atavisms in Culture (2005), The First Person Singular (2007), and Violence and Splendor (2010). ED STECK is a writer from Southwestern Pennsylvania. He currently lives in Pittsburgh, PA. His work often focuses on surveillance and landscape through the direct confrontation with bureaucratic language in government, military, and corporate documents, such as the Wikileaks Afghan and Iraq War Logs. Ugly Duckling Presse will publish his book, The Garden: Synthetic Environment for Analysis and Simulation, in 2013. He has collaborated on publications with David Horvitz, Marc Handelman, and Wintergarten LTD. Most recently, West in Den Haag published A Time Stream in Spaces: The Cultic Parody of Time-Induced Capital as part of the Let Us Keep Our Own Noon group exhibition. terrible today. Everything seems to break. 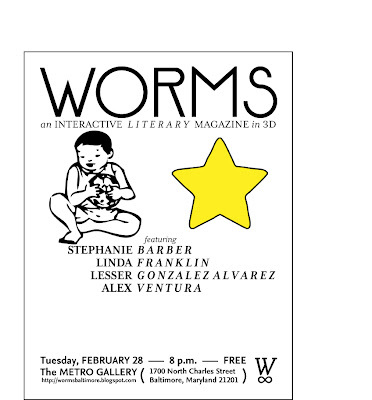 Linda will be performing her work at WORMS on February 28. To apple, and so on. 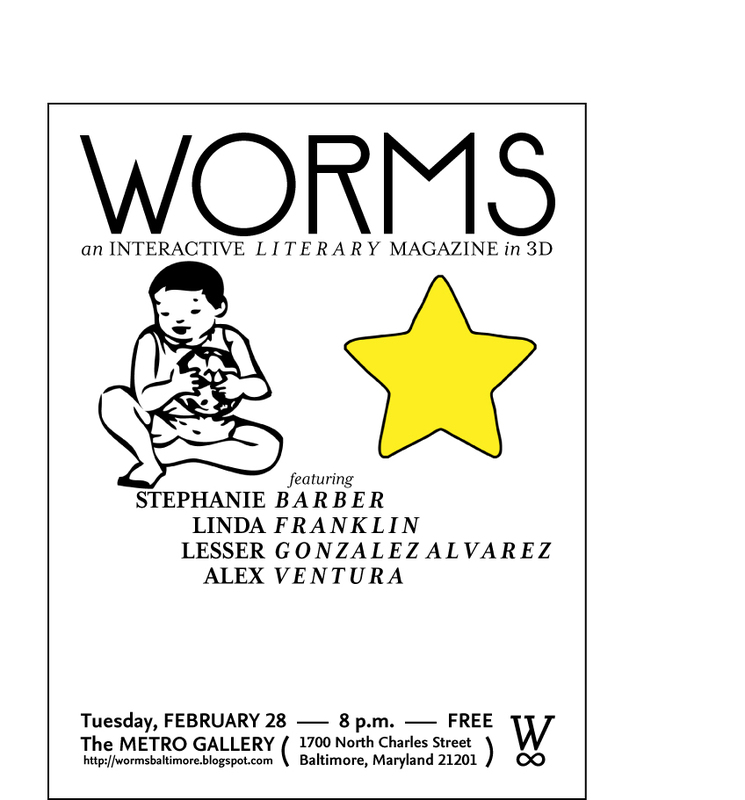 Alex will be performing his work at WORMS on February 28. Celebrate Leap Day Eve at WORMS! We've got Stephanie Barber, Linda Franklin, Lesser Gonzalez Alvarez, & Alex Ventura! LINDA FRANKLIN is a writer, illustrator, painter, sculptor, videomaker, editor, and creative writing instructor. She has always adhered to her father’screed: “Everything might come in handy ... someday.” Linda has been a men’s underwear saleslady, a window dresser, an art librarian, a waitress, a washtub bass player, a storyboard artist, a bike shop manager, and a freelance writer and editor. She has written and/or illustrated over 40 books, none of them fiction. Now she is only writing out of her head instead of a filing cabinet. Look for her blog and videos by Googling her nom de vivre: barkinglips. ALEX VENTURA is working on a trilogy of poetry, fiction, and drama titled Puerto Rico. The book of poems will be out this summer on Brooklyn Arts Press. His goal is to finish the novel ...by December 14, 2012, as his thirtieth birthday present. He is currently on the second chapter. After he writes the play, Alex plans to retire and devote the rest of his creative life to romantic love. He lives in Baltimore.